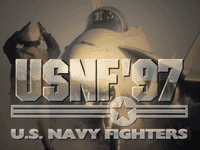 Jane's Combat Simulations United States Navy Fighters '97 aka USNF '97 or USNF97 is a flight simulation video game developed by Electronic Arts. It was originally released in 1996. In the game the player can choose between three different campaigns: one set in the Vietnam war and two fictional ones, one about a Russian-Ukrainian war, and another about a Russian-Japanese conflict over the Kurile Islands.